Talia Hughes ('13) majored in Archaeology and History of Art, and minored in Museums and Society and Classics. 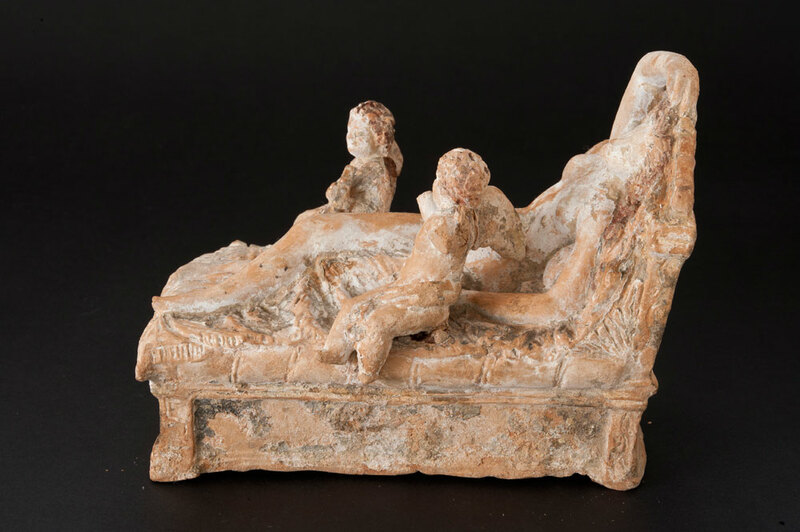 This small terracotta group depicts a reclining female figure with two putti. The figures are shown on a bed adorned with an elaborate headboard. The woman is lying on her back, propped up by pillows. Her right arm reaches over her head and rests on her forehead, indicating ecstasy. Her head is angled upwards and her loose hair flows over her left shoulder. Her right leg is crossed over the left, which is covered by a blanket. While she holds one putto with her left arm, the other sits on her right, holding a lyre with his left hand. Only the right wing of each putto has been preserved. There are no traces of paint on the surface of these figures. Their orange-brown hue is typical of terracotta figurines. In antiquity, small-scale terracotta figurines were made by artists known as coroplasts. These statuettes were mold-made and then fired in a kiln. The vent holes that appear on the back of such figurines helped release gases during the firing process. In this particular piece, the vent is a large rectangle behind the headboard. Vent holes are also thought to have allowed different mold-made parts to be pressed together from the inside. In addition to using molds, coroplasts also modeled such details as fully articulated arms, wings, garlands, and hats by hand. The wings and arms of both putti in this terracotta group were probably hand-modeled. Terracotta figurines were usually painted, and occasionally gilded. First discovered in the late 1800’s at the site of Tanagra in Greece, Hellenistic terracotta figurines became immensely popular throughout Europe. Known as Tanagras, most Hellenistic figurines depict idealized, often sentimental scenes of everyday life. As a result, Tanagras captured the imagination of late nineteenth century viewers, who saw in them a reflection of their own romantic fantasies about the Classical past . The figurines’ widespread popularity triggered the production of numerous replicas in the 1880s-1890s. Different methods were used to create Tanagra-like statuettes. In some cases, modern molds were made from authentic Hellenistic figurines and filled with local Tanagran clay. A number of pastiches, combining ancient and modern parts were also produced. There were also several fantasy pieces that were created in the style of Tanagra figurines, but had no relation to ancient statuettes. It is quite likely that the terracotta group of a woman with two putti on a bed in the JHUAM is a nineteenth-century creation. A number of stylistic choices on the part of the artist point to this conclusion. First, Hellenistic depictions of beds look rather different from the one in the Hopkins terracotta group. A good example of what a Hellenistic bed or couch might have looked like can be found in a terracotta group from Myrina, dated to circa 100 B.C.E., now at The British Museum. The bed on which the two women sit, consists of a rectangular box-like structure without a headboard. The woman’s pose in the JHUAM group is also unusual. 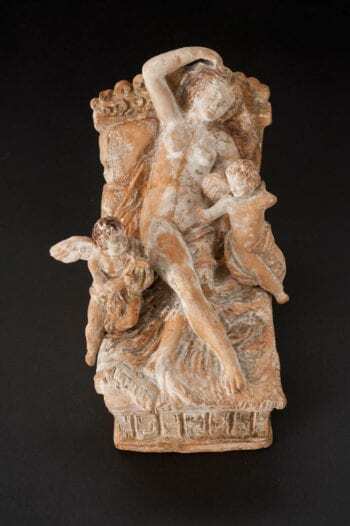 It is unattested among extant Hellenistic terracotta figurines, and recalls instead Renaissance representations of Venus, like Titian’s Venus and the Lute Player. The figure’s dramatic, sensual pose echoes other nineteenth-century fantasies of the Classical past, which further suggests that this terracotta group is not the work of a Hellenistic artist, but a product of the Victorian era.